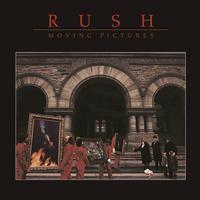 Not only is 1981's Moving Pictures Rush's best album, it is undeniably one of the greatest hard rock albums of all time. The new wave meets hard rock approach of Permanent Waves is honed to perfection -- all seven of the tracks are classics (four are still featured regularly in concert and on classic rock radio). While other hard rock bands at the time experimented unsuccessfully with other musical styles, Rush were one of the few to successfully cross over. The whole entire first side is perfect -- their most renowned song, "Tom Sawyer," kicks things off, and is soon followed by the racing "Red Barchetta," the instrumental "YYZ," and a song that examines the pros and cons of stardom, "Limelight." And while the second side isn't as instantly striking as the first, it is ultimately rewarding. The long and winding "The Camera Eye" begins with a synth-driven piece before transforming into one of the band's more straight-ahead epics, while "Witch Hunt" and "Vital Signs" remain two of the trio's more underrated rock compositions. Rush proved with Moving Pictures that there was still uncharted territory to explore within the hard rock format, and were rewarded with their most enduring and popular album.